It’s my first blog post for DH @ W&L! Hi, everyone! I’m Sydney Bufkin, the new Mellon Digital Humanties Fellow. I have been—and will continue to be—a Visiting Assistant Professor in the English Department, so if I look familiar when you drop by my office, that’s likely why, especially if you’ve taken WRIT 100 in the past two years. 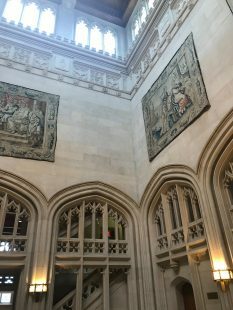 I moved over to the library last week and immediately hit the road for the Liberal Arts Consortium for Online Learning (LACOL) workshop at Vassar College. 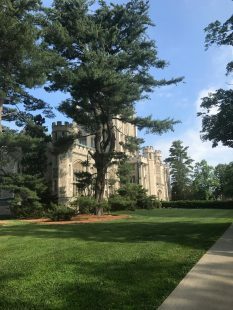 LACOL is a consortium of nine liberal arts colleges formed to share resources about online learning, blended learning and digital pedagogy, and to collaborate on projects across the consortium campuses. The consortium has held three workshops since beginning in 2014, as well as a number of hack-a-thons and mini-workshops on topics such as adaptive learning, language instruction, social annotation and others. Washington and Lee joined LACOL this year, so this was the first workshop not only for me, but for the other W&L folks, as well. I was particularly excited about the workshop because I’m all about digital pedagogy, especially using technology to make the liberal arts classroom even more active and engaged than it traditionally is. I’m also interested in the future of higher education (for both professional and philosophical reasons), and I’ve watched with some trepidation as for-profit tech startups like Udacity and EdX have shifted the trajectory of higher ed in recent years. I like that the folks at LACOL are thinking about smaller educational units like the SPOC (small, private online course) rather than the MOOC (massive, open online course), while still exploring ways to make higher education more equitable and more accessible. One of the highlights of the workshop was a keynote by Bryan Alexander, an “internationally known futurist, researcher, writer, speaker, consultant, and teacher, working in the field of how technology transforms education.” Bryan opened his talk with an image from Jonathan Edwards’s “Sinners in the Hands of an Angry God,” just in case there was any confusion about his assessment of the direction higher ed is heading. His talk raced through a long list of hard truths, from the growing inequality in the United States to decreased enrollments and increased financial pressures on nonprofit, four-year colleges. He noted that small liberal arts colleges represent just 5% of college students in the US, but have an outsized profile and visibility relative to that market share. He called on those colleges to meet the changing landscape of higher education by adapting in ways that improve access to education not just for students from privileged backgrounds, but for everyone. Bryan’s fire and brimstone was set in opposition to the beautiful Vassar campus, especially the breath-taking library. I only had a little bit of time there, but I spent several minutes taking in the arches and stained glass. I attended working group sessions for LACOL’s Active and Engaged Reading group and came away with lots of ideas about what reading looks like in our screen-saturated moment. Once question the group considered was why we don’t generally teach the reading process in the way we teach the writing process. We often think of reading as something you either can do or you can’t, sort of like riding a bicycle, but it’s much more akin to writing—you have to identify different disciplines, genres and situations and know how best to read for each case. And like writing well, reading effectively is neither magic nor something you soak up through intuition; it’s a set of steps and processes you learn to apply and adapt. The working group surveyed some tools and technologies that can help us be better readers, from low-tech approaches like group read-ins in the library and professors modeling their own reading practices to annotating tools like Lacuna and Hypothes.is. I was excited share the Critical Reader’s Toolkit, a project I worked on when I was at the University of Texas that helps demystify the reading process for literature students. We had opportunities to hear from other people, both formally and informally, who are working on digital pedagogy at colleges around the country. Bryn Mawr just introduced a new digital competencies framework that emphasizes a number of key skills, including “Digital Survival Skills.” Lots of people were interested in questions of digital citizenship and digital competencies, and we had a lively brainstorming session about how we might collaborate across institutions to address digital fluency. I always come back from conferences and workshops with my brain buzzing, and this was no exception. I’m excited to see what LACOL does next. Thank you for the kind reflection, professor Bufkin. Is anyone at WLU using Hypothes.is? Yes! 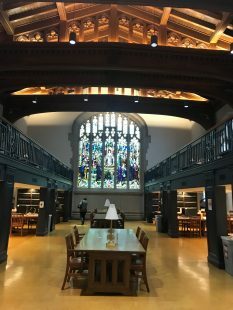 Faculty in the English department have used it to teach Shakespeare and to annotate letters from special collections that a class was collaboratively curating. I’m planning on using it for peer review and discussion of online essays in my writing class next winter.